Everyday life should be beautiful. Sharing cute ideas and things to make you smile. I don't generally have a lot of patience when it comes to decorating cakes, I usually get the baking done and I want to eat the bake. Right away. But over the summer I had a go at some decorating for family birthdays - hence the brightness and craziness! 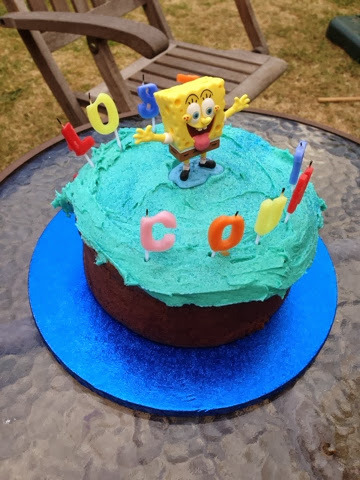 Chocolate sponge with bright blue icing, blue glitter and a spongebob topper. This was for my dad, spongebob is one of our silly shared interests. The candles say 'Lost Count' because I am cheeky! This was the cake I made for my mum's birthday, it was delicious! I actually cheated and got two small Victoria sponges from the shops, then stacked them and covered in buttercream. 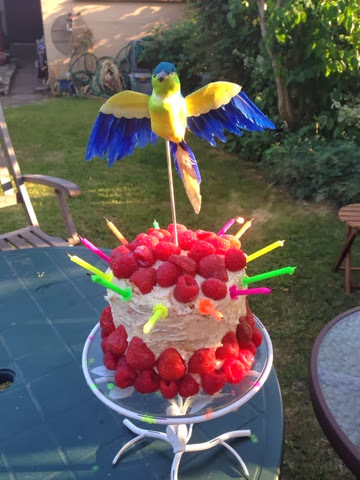 I surrounded the cake with fresh raspberries and noone candles, and topped with a gorgeous parrot from Tiger. Considering I work in a cake shop I really need to step up my decorating game - I need to learn how to pipe icing! So I've been AWOL for the majority of this year. But I'm back with some cute owl purchases of late. 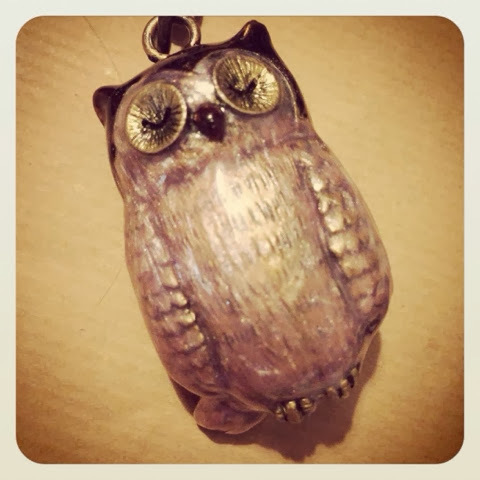 The sweetest owl keyring from Paperchase. It's glossy and enameled, at £6. 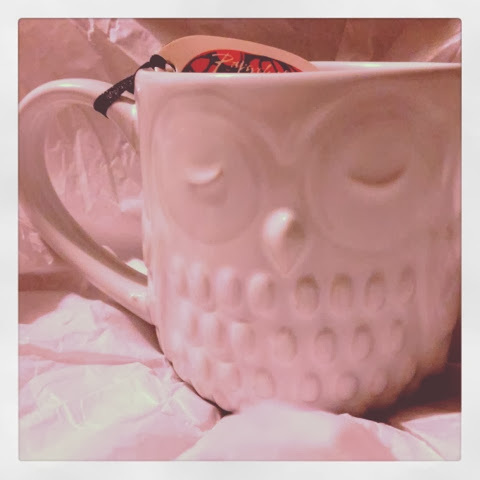 An owl mug with really nice detailing. Also Paperchase and £6. 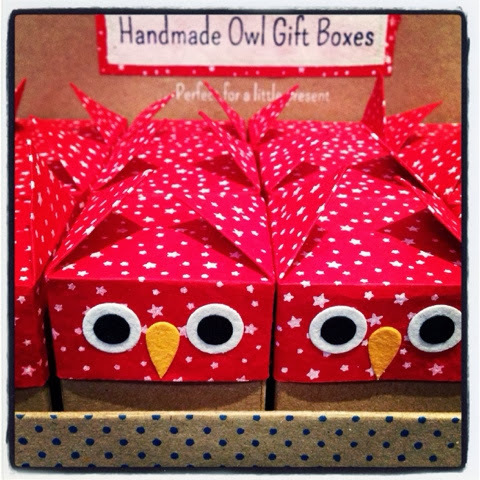 These handmade owl gift boxes are actually from where I work! £1.75 by Sass and Belle. That's all for now! But I'm going to post crafts, bakes and events that are mightily backlogged!!! I'm back! Have been slightly hibernating - life can get complicated and so I have been ignoring the blogging world. But today I had a good day, and allowed myself to shop for the first time in a long long time. I have been looking for the perfect denim shirt for ages, and went into a shop I had never seen before today, called Select and managed to pick up this for just £16. It is exactly what I have been looking for. I love the pearly popper buttons and the elbow patches. I have a cute Aztec print skirt in black, purple and blue that I think would go well with this. Any other styling suggestions? Just wanted to share a few photos that sum up my Christmas 2012. It's been a busy December so was so happy to have some days off to spend with friends and family. Hope everyone had a great Christmas! This was my Christmas nail art - was so sad that my top coat made everything bubbly :( but it looked good if you weren't scrutinizing up close. The pink and mint polishes are from Rimmel. The sparkly ones are Indian Ocean and Blizzard, both from Model's Own. Obsessed with Blizzard!! And the nail art is from Npw and Claire's. Christmas silliness in Liberty of London! South Bank Christmas market = magic. Best caramel hot chocolate. Christmas tree brownie (extra chocolatey) and peanut butter / choc chip cookies. All gluten free goodies! I am a twenty-something girl living in London, who is always searching for cuteness.